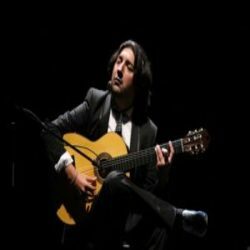 Antonio Rey Navas (born in Madrid in 1981) is a Spanish flamenco guitarist and composer. He is the winner of several national and international flamenco guitar competitions. Antonio Rey Navas began his artistic career at the age of ten when he accompanied his father Tony Rey in various tablaos (flamenco venues) in Mexico. A few years later, he made his first tour of Japan with the dancer Yoko Komatsubara. At eighteen years of age, he worked in the company of Antonio Canales and later composed music for Gallo de Pelea for the Nuevo Ballet Español (New Spanish Ballet). Rey composed other compositions, such as “Romeo and Juliet”, for the Antonio Canales which was founded in 1996 by Angel Rojas and Carlos Rodriguez. He went on to perform in the capacity of accompanist for singers and dancers Manuela Carrasco, Rafael Amargo, Farruquito and singers Rafael de Utrera and La Tana, among others. In 2003, he won first prize accompanying singers at the Festival de Cantes de Mina de La Unión competition in Murcia. In 2010, he won first prize in the Concurso Nacional de Arte Flamenco de Córdoba. He also won the Concurso Nacional de Guitarra Flamenca Niño, the Premio del Certamen Nacional de Guitarra Flamenca de L´Hospitalet de Llobrega as well as the Concurso Internacional de Guitarra Flamenca Los Cernícalos de Jerez. His first album was produced by Gerardo Núñez and is entitled A través de Ti. On his second album, Colores de Fuego, he collaborated with Estrella Morente, Vicente Amigo and Josemi Carmona, among others. Due to his virtuosity, Antonio Rey has not only forged a solid career as a soloist in Spain and abroad, but throughout his career, he has also worked with names such as Antonio Canales, Joaquín Cortés, Miguel Poveda, Diego El Cigala, Estrella Morente and other Spanish celebrities.